We’re kicking off Fashion Revolution Week with “swap and pop”. Join us on Saturday, April 20th from 12pm – 8pm as we gather with our expert makers and menders. Marie Kondo your closets and meet us in Harlem! Bring your gently used clothing; Women’s, Children’s, Men’s + Accessories. Swap them for items that are “new to you” or repair + revive your own items with help from our members. Lost a button? Popped a stitch? Want to Upcycle that Old shirt into a bag? Isabel Varela will be giving D.I.Y. demos all day and can help you upcycle your goodies! Need those old trousers to be shortened or maybe a little nip and tuck in the waist? SewSustainable Alterations will keep your clothes longer by making alterations easy and convenient. Have an old flame that needs re-kindling? Custom Collaborative will have a menu of customization, personalization, and costs for your pieces in need of some love. In the market for new Fair Trade and Sustainable products? 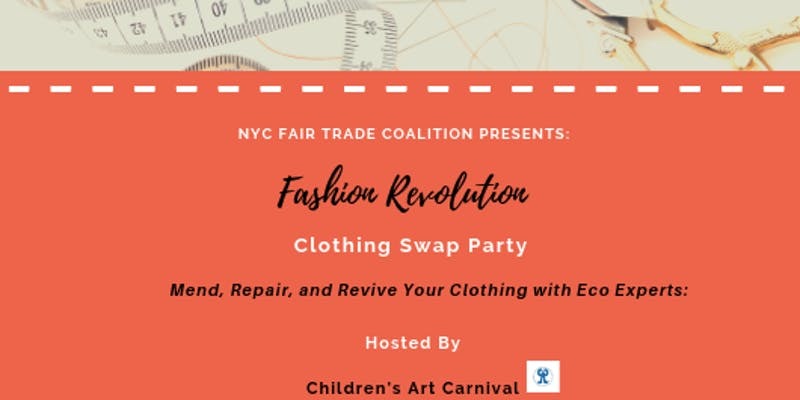 We will have a few of our own NYC Fair Trade Coalition members at the Pop-Up selling products and some with lucky giveaways! Oh, one more thing…there will be sweets, treats, and drinks! “We are Fashion Revolution. We are designers, producers, makers, workers and consumers. We are academics, writers, business leaders, brands, retailers, trade unions and policymakers. We are the industry and the public. We are world citizens. We are a movement and a community. We are you. WHO IS NYC Fair Trade Coalition? Join the NYC Fair Trade Coalition every 3rd Monday of the month for an evening of planning, organizing, and collaboration. Learn how to get involved and push the sustainable fashion movement forward! $8 to listen and learn.